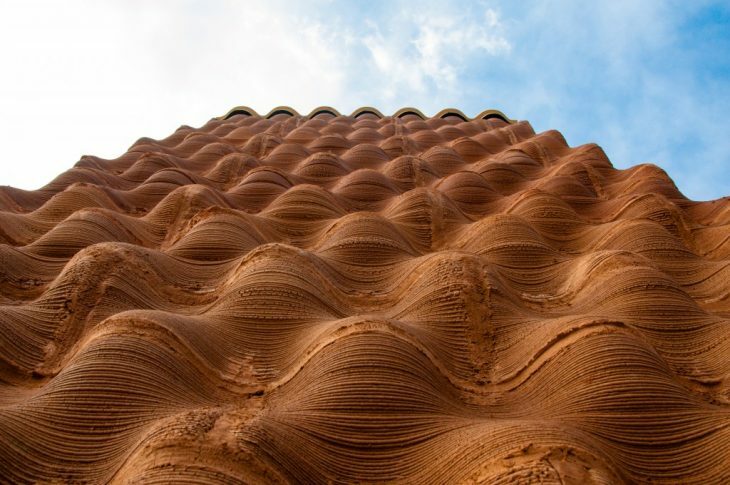 Digital Adobe is an innovative research agenda oriented to producing architectural solutions with natural materials and additive manufacturing or 3d printing. 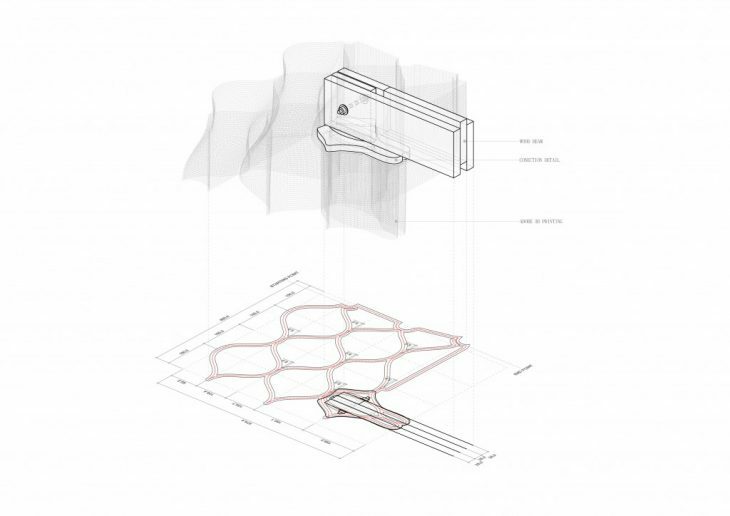 The technology, developed in the applied research post graduate program Open Thesis Fabrication, enables to customize the form of a building on multiple scales. Tailoring, from the global form, to the resolution of the section of the wall, allows us to create highly performative structural and passive/climatic behavior. 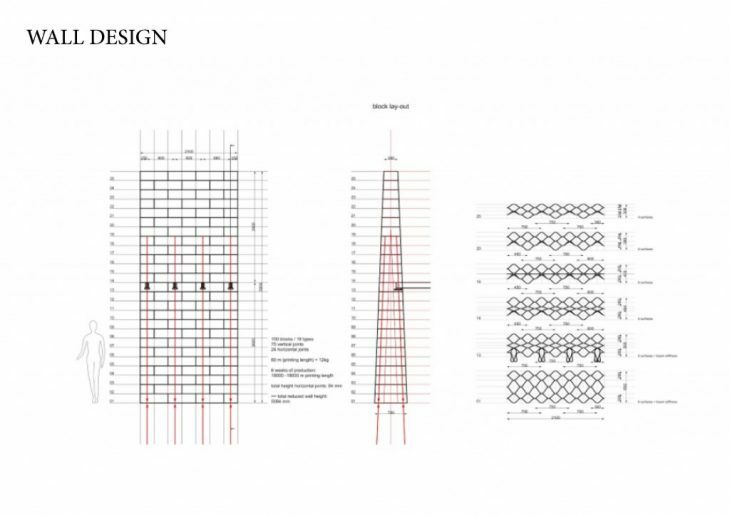 Through the use of parametric modelling and performance evaluation methods in the project’s development, the project relies on an informed architectural design. 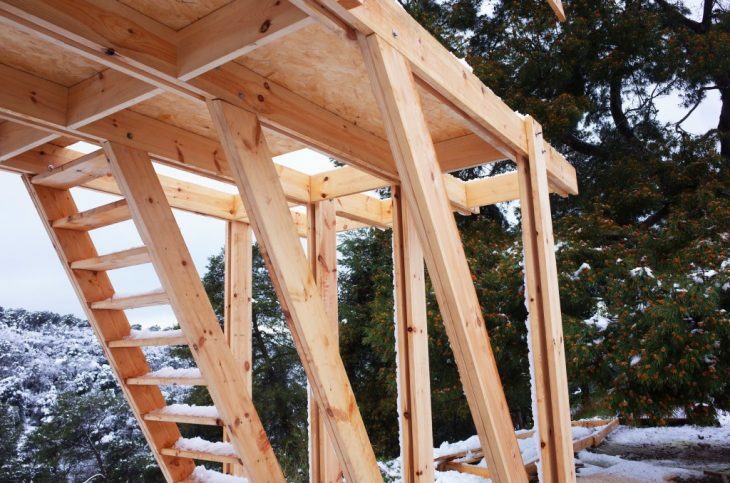 Beyond the performance enabled through the design development, the project also develops efficient construction methods and material use: onsite robotics allows the use of local and natural materials for construction. 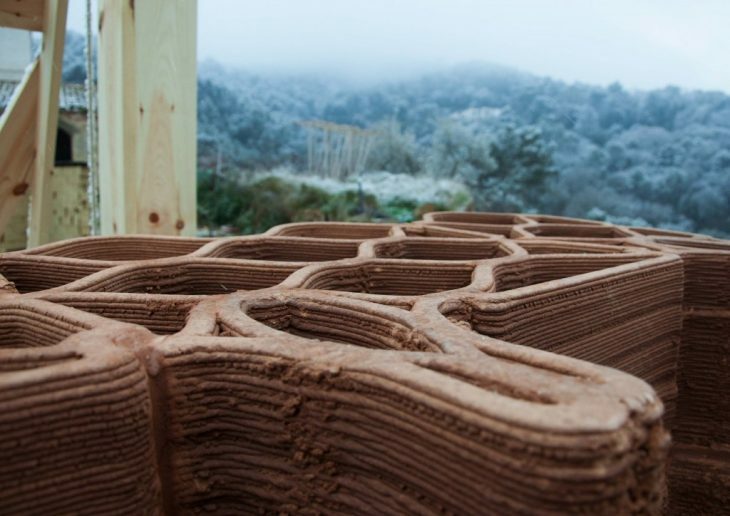 The research explores built solutions to a wider extent, encompassing the local clay mix, 1:1 scale prototyping, and the implications of this technology applied to the broader construction sector, through the elaboration of diverse construction scenarios. 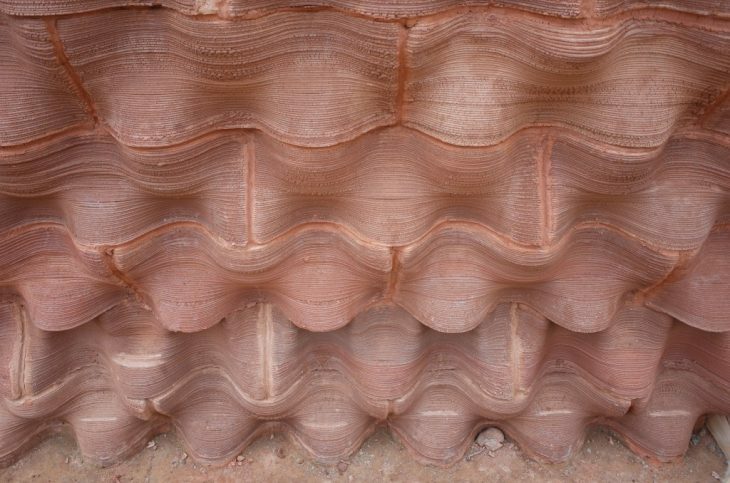 Starting with a series of smaller-scaled prototypes that have verified the assumptions on the structural and climatic performances of the design of adobe printing on buildings, a 1:1 scale prototype was later on constructed in an attempt to bring the explorations to a real-life architecture level. 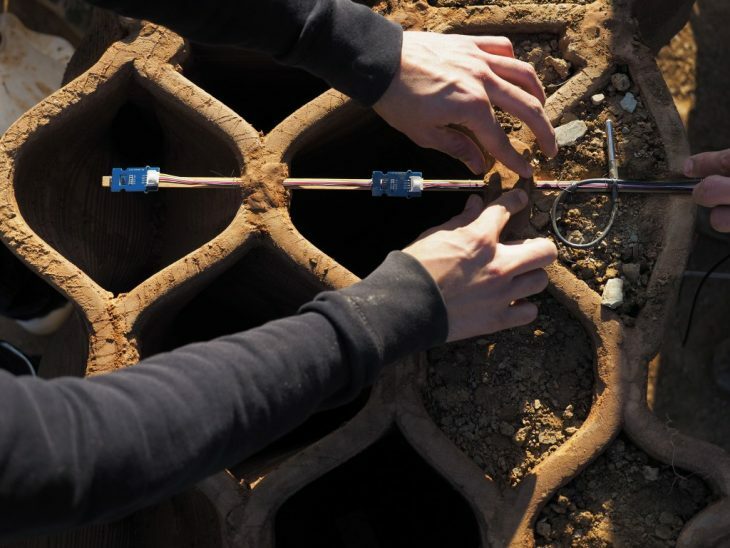 The conclusive outcome is installed in IAAC’s Valldaura Self-Sufficient Lab campus. 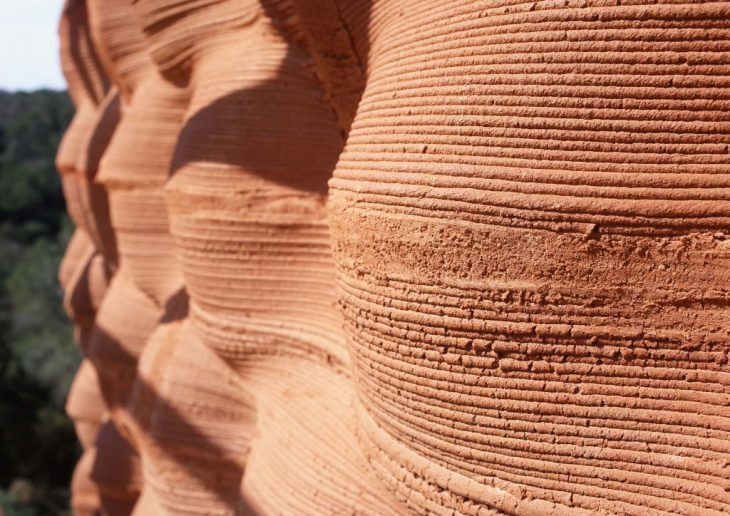 It is a 2-metre wide and 5-metre high printed clay wall with a varying thickness (0.7m at its bottom and 0.2m at its top) facing the south. 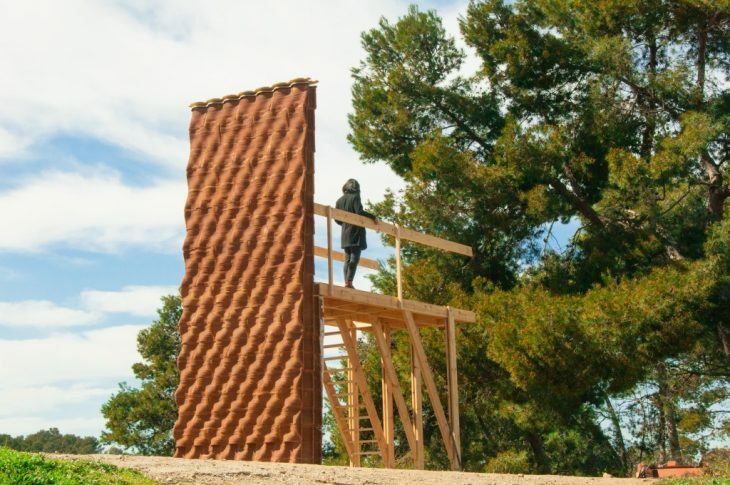 At a height of 2.6m, a wooden slab rests on the wall, as to simulate a clay/wood building unit, where the connections between two materials and the vertical load from horizontal slab can be tested. It is a self-standing structure in which the thickness of the wall and the geometry of its 6 layers are designed to match the structural necessities. 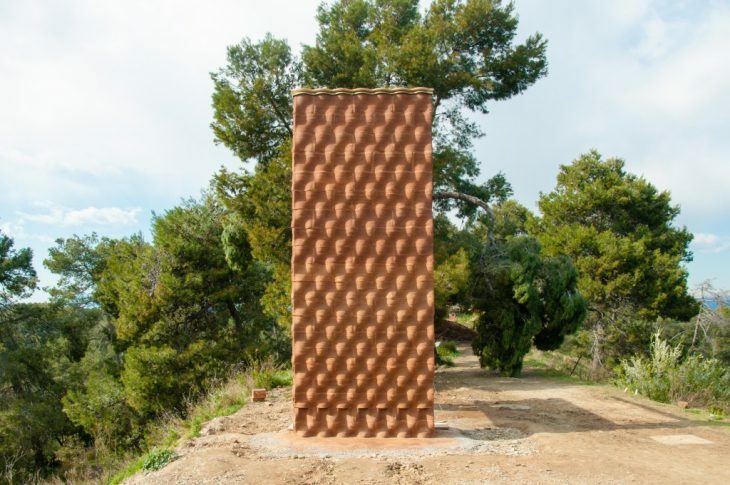 The wall is designed according to the local climate, taking into consideration the solar incidence, the yearly temperatures and the humidity. Two aspects, climatic and structural performances, are again the main focuses of the this 1:1 prototype. 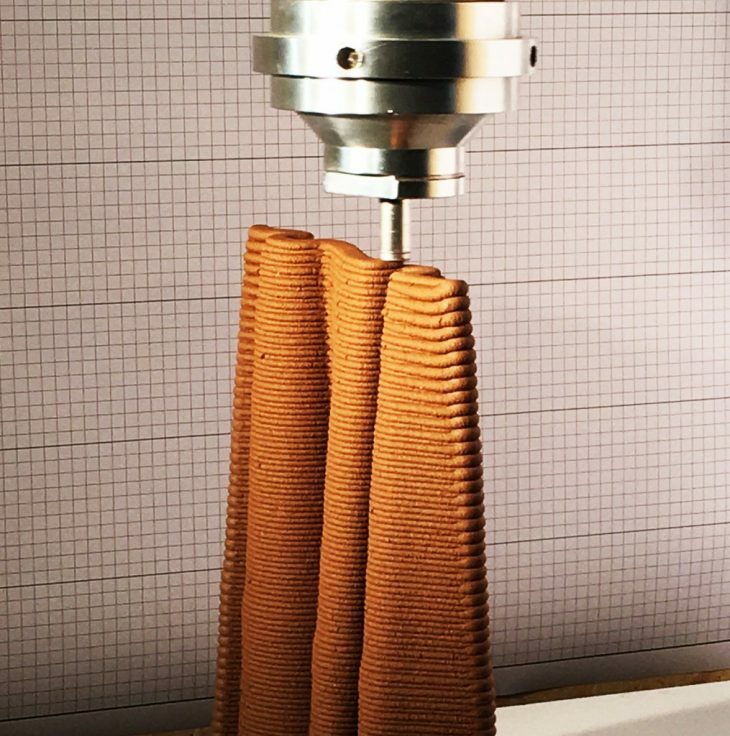 With the long established understanding of clay’s thermal properties to moderate heat transmission, the team has sought for a design to even enhance such properties. 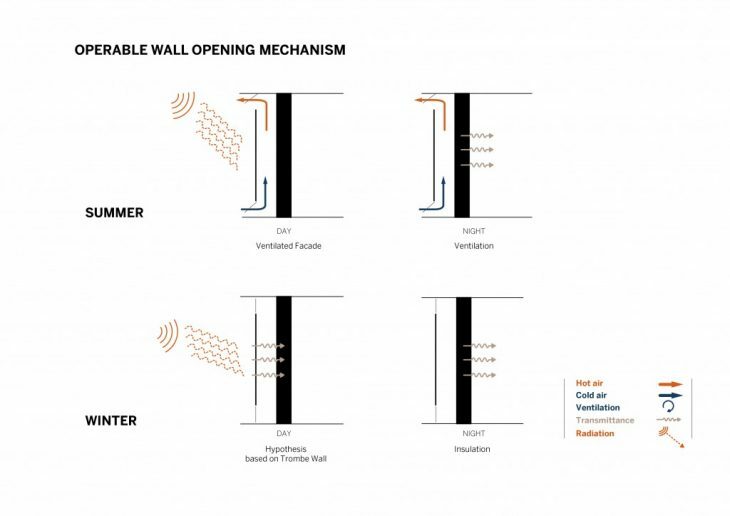 A ventilated wall design enabled through operable top/bottom openings is then created to either reduce heat gain in summer time through convection between top and bottom openings, or to retain heat in the winter as both openings are closed. Its external geometry consists of surface of bumps of which the calibrated geometry creates a self shading pattern, optimising cooling in summer and heat absorption in winter, taking into consideration of the solar radiation angles of the locale, which in this case is Barcelona. 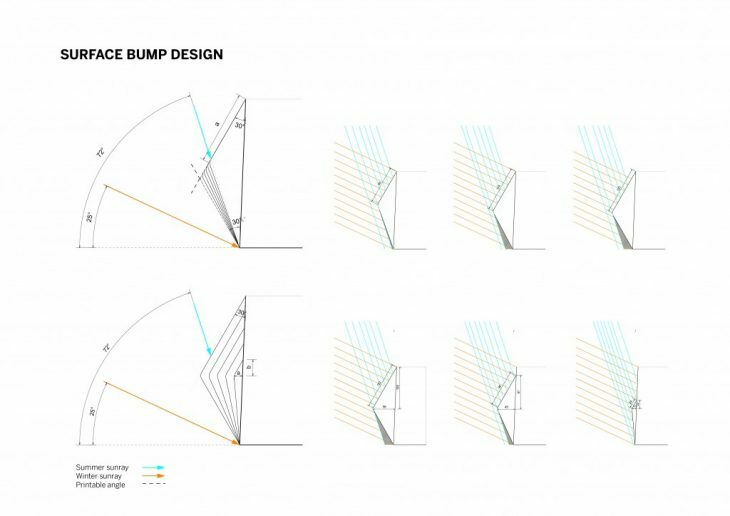 The other crucial aspect being factored into the bump design is the printability, where the design is confined to cantilevered angles of less than 30 degrees as a result of its materiality and printing technology currently available. These climatic objectives are then incorporated on the prototype in the way where the west-ward would have have higher heat gain, while the east-ward would have lower heat gain at a given time. That is, a greater amount of thermal mass and less ventilation on the west-ward wall, and a lesser amount of thermal mass and more ventilation on the east-ward, through which a comparison of performances driven by variations on design parameters can be made and observed with the help of embedded temperature and humidity sensors. The internal cavities of the wall are earth-filled in the centre to act as thermal mass and hermetic air-filled to act as insulation. 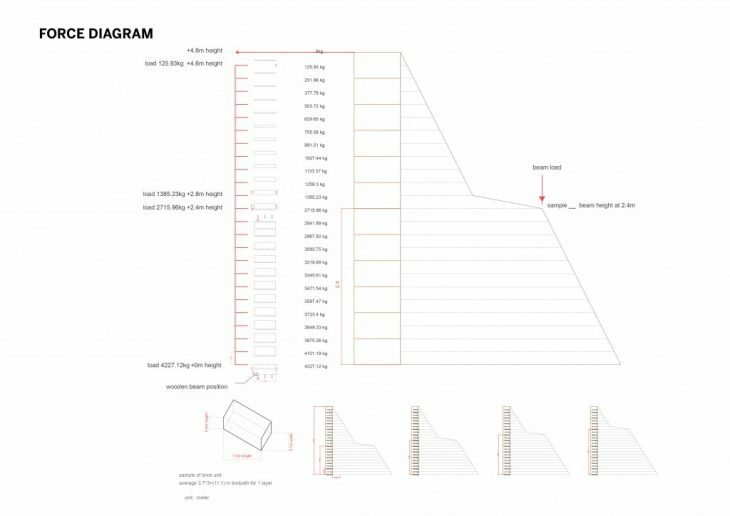 The prototype is designed to be self-standing, and thus both the wall’s self weight and the load capacity of the wooden slab are taken into account for the design of the global geometry with regard to the thickness of the wall as well as the connection of where the wooden beams meet the wall. The geometry of the connection unit where the beams rest on the wall comes in a protruding platform at the height of 2.6m, which gradually receding into the wall as it reaches the bottom. 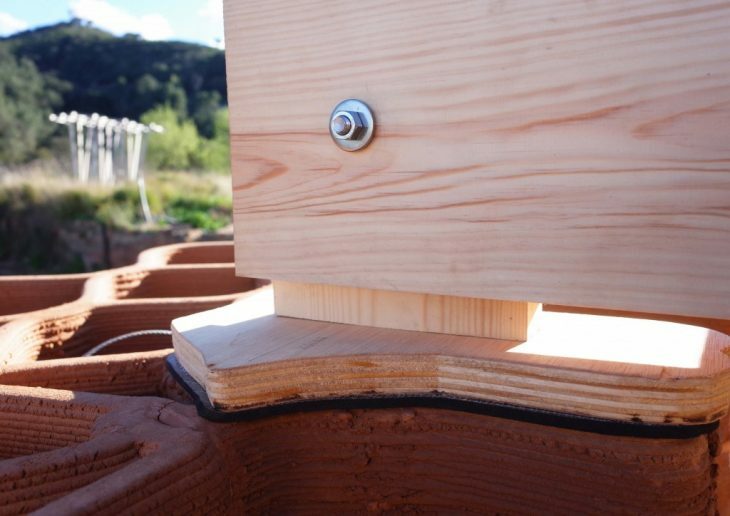 This allows for a more distributed vertical load to go onto the contact brick and thus an increased level of the wall stiffness to hold the beams in place. 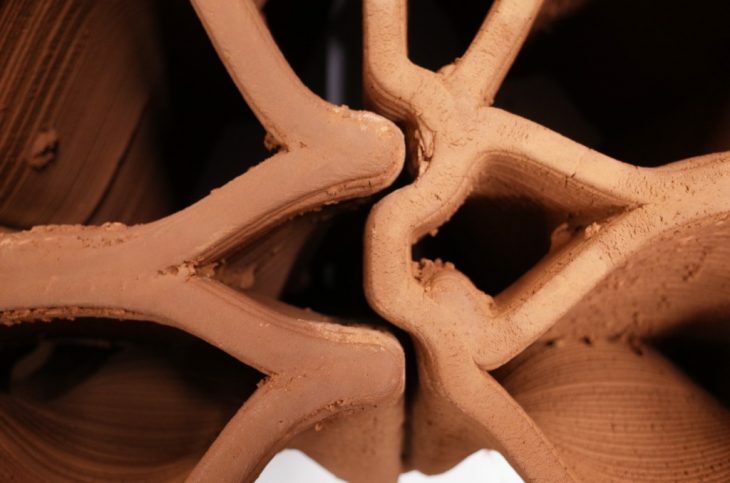 The tolerance of the imprecision in printing process and the ease for final assembly is also considered in the brick-to-brick connections. The prototype focused on recycling 2 tons of previously printed material in 2017 and to demonstrate the capacity of this technology to build a piece of architecture at 1:1 scale in outdoor conditions. 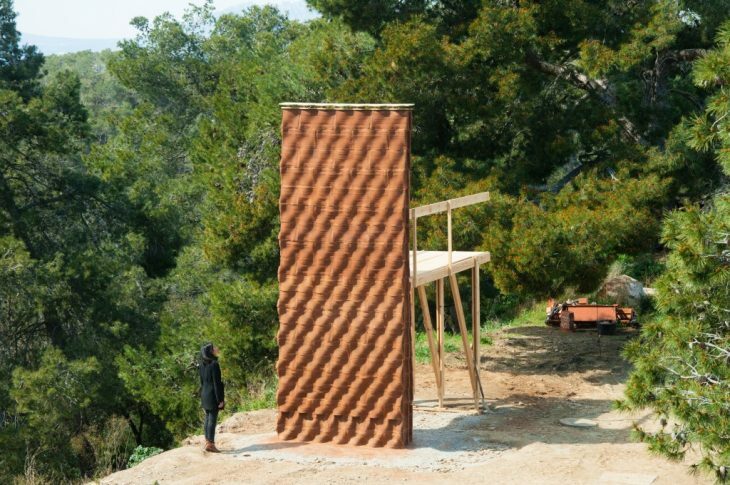 The fabrication is based on sustainable recycled clay material, and thus creates little environmental impact. The use of parametric design and robotic fabrication allowed to customized each and every element as to adapt the structural and thermal capacity of the wall to every local needs. The final design resulted in 26 254 meters of 3d printing path, divided in 99 individual element finally assembled in 5 days in IAAC’s Valldaura Self-Sufficient Lab campus in March 2018.